Make compassion your co-pilot, and you’ll improve your traffic experience — and maybe your life. 1. Before you start your car, be mindful of your intention to drive with awareness and compassion. Just as you set out with the intention to drive to a specific location, form an intention to reach your destination in a calm, compassionate way. 2. Relax — and keep relaxing. Check and recheck your shoulders, arms, legs, back and hands on the wheel, and release tension as you drive. A relaxed body helps relax the mind. Focus your attention on the task at hand: driving. Keep your focus on the road, other cars and your speed. 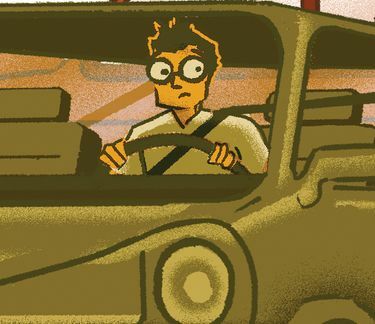 If you find your mind wandering, gently bring your attention back to the act of driving. 4. Things happen. Accept them. Rude drivers, traffic jams and other delays are part of the driving experience. When you feel agitated by these events, take a moment to relax and realize these things aren’t happening to you; they are just happening. 5. Give ’em a break. By exhibiting compassion and forgiveness to other drivers when they make errors, you are being compassionate to yourself by not getting worked up over something beyond your control. We all make mistakes. Don’t make the mistake of getting angry about it. Turn off your cellphone. Turn off the radio. Most important, turn off your tendency to think about the past or future. Be fully present in the now. 7. Feel your driving experience. Notice the feel of your hands on the wheel, your feet on the pedals, the temperature, the sounds and the sights. So many of us miss the reality of the current moment all around us. 8. Take your experience into the world. If you have a relaxing, mindful and compassionate experience while driving, bring that feeling with you as your leave your vehicle. If you practice this regularly, you will create a better life and a better world.